Discussion in 'Dedicated Source Components' started by ChordElectronics, Jan 9, 2018. I’m in the same boat. I’m using a 6 year old MacBook Air as a bridge for my music files stored on an external hard drive and my Qutest. The new Project has caught my eye since its at the price point I’m looking to spend. With that said, I just learned about the new Stack Audio Link made in Britain and it looks pretty sweet, so I’m waiting for it to be released. I use the Sonore microRendu 1.4 which does a good job, but recently many folks have started to swear by using an Intel NUC running the latest version of audiolinux OS (from RAM, no hard disk) as a streamer. Apparently this sounds amazing, if I were in the market for a new streamer that’s what I’d do. I love your optimism. I really do. And for the sake of my bank account I wish it was the case but I do not believe there will be a lower end version of the HMS. Having the 3 price points of DACs (Dave, TT2 & Hugo 2/ Qutest) makes sense to capture the different segments of the DAC market. However, while Blu2 and HMS are also digital products, they are not DACs; they are upscaler for the DACs. HMS exists because some consumers do not need the CD transport, and Chord is able to provide the upscaling technology without the CD transport at a lower cost. Having 3 upscaling products in this category will just lead to cannibalization of the Blu2 and HMS sales. Well according to Rob himself,and he can NOT claim I am misquoting him in this case. He said at a seminar at Canjam in Singapore last year that personally he wants the mscaling to become available in" HUGO 3 or 4." That is a direct quote: I was there and personally talked to him about it afterwards. So I would not absolutely rule out a cheaper M Scaler. But do not expect one in the immediate future unfortunately. is the price of their toys". My advice to those interested is still, if you mainly listen to well recorded acoustic music M Scaler extremely expensive as it unfortunatetly still is, is something you should audidition if you want to hear how natural and realistic digital recordings can sound with mscaling applied. And if your preferences are elsewhere I still don't understand why anyone would spend this much money on something that is obviously designed to keep distortions and other typical digital artefacts as low as possible. Yes that's very much the intent - to get M scaling into a lower price - but I am less optimistic than I was last year. Getting M scaling to work at lower price points needs lower cost and more capable FPGAs and this is looking less likely; cost per gate as process is shrinking is actually increasing, and this has never happened before. In this sense, Moore's law has already broken. The whole point of more complexity is that it occurs at a lower cost per gate, and this is what has driven electronics over the last 50 years; but that process has stopped. Another point - Xilinx used to create new FPGA generations where each family had more capability at a lower price, and this used to happen every 2 or 3 years; today the economic price point is the Artix 7, and that family was launched 6 years ago, with no replacement in sight or rumored about. Another point - Intel has had serious problems migrating from 14nm to 10nm process, with speculation that the 10nm process has been cancelled - which Intel denies. But for sure they are having serious problems migrating down to 10nm, and it looks like it won't get shipped till 2019 - that will make the process 3 years late. So I am not so optimistic as before - it may actually never happen if they can't make die shinkages with lower cost. Ragnar-BY, AndrewOld and theveterans like this. You can add Euphony PTS server to this list. I have not heard the Pro-Ject Stream Box S2 Ultra yet, but it`s price brings up some questions. The cheapest EU price, which I have found online is around 700 Euro. Add 300 euro and you can buy basic Euphony PTS (250Gb SSD included) or a basic Innuos ZenMini Mk3 (1TB HDD included). Euphony and Innuos are music servers and could run Roon core, Zen is also capable of CD ripping. Pro-Ject S2 Strem Box can only do streaming and endpoints. You still need some kind of network storage. And if you are a Roon user, you`ll need a computer to run Roon core. It is very interesting if Pro-Ject really made Rasberry Pi to sound so good, that it could justify this price level without extra functionality. Thanks... For me their practical qualities are secondary to how they sound. The Digione Signature could also be in the mix for less than half the price of the S2 Ultra. I would use either as a Roon Endpoint. It is simply a question of SQ for me. Inside I use a Samsung 1TB Evo SSD, which works very well (SSD are strongly recommended, because they are total silent and have low power consumption). So, for me there is no need for an additional device "for storage", the SDD will deliver the data "bit perfect". I use my Raspberry Pi together with a Digione (the "normal one", not Signature). I think together with a DAC like Qutest there is no need to reduce jitter from 0.6 ps -> 0.4 ps (! ), because Robs "DPLL thing" anyway eliminates completely any source jitter. Indeed, SSDs are superior. If you don`t need Roon, Stream Box or even basic Pasberry Pi might be good solution. ALLO Digione sounds great. I did not buy it only because of its 24/192 limit on BNC output. By the way, I think that Qutest USB input is great. My previous USB-DAC sounded awful without USB decrapifier. I used Schiit Wyrd and it was significant upgrade over direct connection. With Qutest USB-decrapifier makes so small changes, that I`m not even sure if it is a positive change. After some listening, I decided to put Wyrd away from the system. With all this in mind, I can`t wait to hear Qutest from good coaxial source. @Rob Watts thank you for the info. Very interesting, as always. Can you help me with DSD-playback, please? 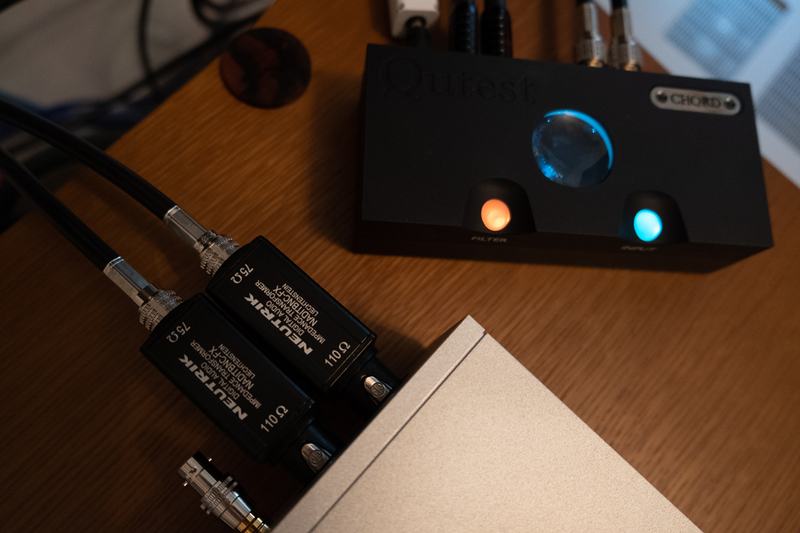 I`m using Qutest via USB from MacBook Pro. Music in DSD256 from nativedsd.com. There are no problems with PCM hi-res, including DXD (24/352,8). Only with DSD. I`ve tried three different players: latest Audirvana, Colibri and Bitperfect with it`s DSD Master add-on. Colibri makes the worst experience. It plays DSD, but I get a lot of clicks during playback. Audirvana with default settings plays .dsf file good, but Qutest light was blue, not white. Processor usage significantly raised, so I assume some type of conversion was involved. If I set Audirvana to DoP I get white light, but there are clicks during playback. Much less clicks than it was with Colibri, but still. Creating "Hybrid-DSD" with DSD Master and playing it with BitPerfect is not the most comfortable solution, but sounds better. I still had some clicks, but much less than in previous cases. After taking the USB-decrapifier out of chain, I found that I have less clicks. After changing my USB-cable with more expensive one (AudioQuest Cinnamon) situation improved once again. Now everything sounds great, but occasionally I might have one or two clicks during the playback of one track. I don`t understand what`s the reason. Is it my USB output to blame, or my software. Unfortunately, I don`t have any other sources, capable of DSD streaming, to check if it`s a problem with my DAC. As you write it seems that the coax is better than the usb, I'm really very satisfied with my Qutest that I've always used with the usb (with Intel nuc, windows 10 and Foobar) , the difference is so much that it is worth spending on an interface that allows you to use the Qutest with the bnc? I use JRiver on a Windows 10 machine and don't have click issues with DSD - even with DSD512 (then using Chords ASIO driver with native interface format). it's USB bus with other peripherals like the track pad and camera and they can interfere. Finally he could try with a free trial of Roon just to see what happens." Another thing to try, with Audirvana - try up-sampling to PCM705/768kHz (since there's no recordings) to Qutest. Just as a test only. Because if PCM705/768kHz struggles in your chain, DoP256 won't work well either. 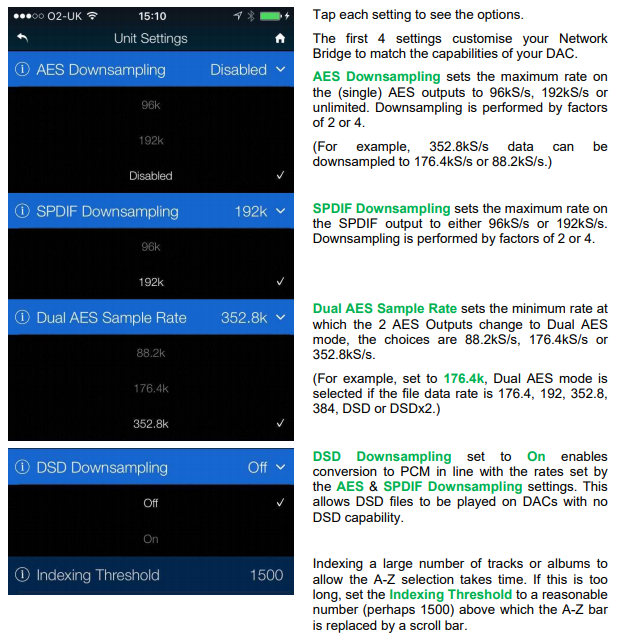 I just try connect my dCS NB dual AES to Qutest, It can playback all sample rate music (PCM & DSD, even DSD128) without any problem all night, except those sample rate equal to or below the "Dual AES Sample Rate" config in dCS NB settings. They will playback in mono, and suffer random pops and clicks noise. Any suggestion or experience can share ? Meanwhile, I have config the "Dual AES Sample Rate" to 88.2k, and use Roon to upsample music =< 88.2k to 96k or above, and this works flawlessly. Seems NB only use dual AES mode for upper sample rate, but Qutest use this for all if it sense it is in dual connection. There was almost no load on processor, but I will try to experiment in this direction and quit all programs during playback. And indeed, there is difference between USB ports on MacBook Pro. Mine is "late 2013 model" and it`s left-side USB port sounds significantly better than one on the right side. By the way... I wanted to ask about BNC inputs, but I assume you`ve already answered a lot of questions about different digital inputs. Can you give a link to explanation why coax inputs sounds better? Can someone please post a photo of the included 5Vdc power supply that comes with Qutest? If possible, a clear photo showing the text on the PSU. Sources - Innuos Zenith SE, Auralic Aries, various Meridian vintage CD players. Digital - Chord Blu Mk2 MScaler, Hugo MScaler & Dave. Speakers - ATC SCM150ASL, Spendor SP200, SP100R2 & S100, WAVE modified Dali 104.